Lead paint is common in homes that were built before 1978, which was the year that the federal government banned lead-based paints. When lead paint is old, it cracks and flakes off, emitting dust. If it does not get remediated, it may poison people exposed to it, especially small children, who often put their mouths on exposed surfaces. Lead poisoning may be difficult to detect, but in children, symptoms may include developmental delays, loss of appetite, learning difficulties, weight loss, irritability, vomiting, and hearing loss. Adults may also present symptoms due to lead exposure, such as muscle pain, constipation, joint pains, headaches, memory loss, reduced sperm count, and mood disorders. Victims may need to retain a lead exposure attorney to explore their legal options. At Moll Law Group, our toxic tort attorneys are ready to help you seek compensation for injuries arising out of lead exposure. It may be difficult to determine who should be held accountable for lead poisoning. In most cases, lead poisoning claims are pursued against landlords that left old lead paint in place or refused to repaint a residence, resulting in children living there being exposed to lead. Most often, negligence or breach of the implied warranty of habitability are the theories under which claims may be asserted against the landlord. To successfully establish negligence, you will need to prove a duty, a breach of duty, causation, and actual damages. The first step in most lead poisoning cases is for a child to be tested for lead poisoning. Some children have developmental delays or other symptoms of lead poisoning, but their actual blood levels may not rise to the level of a claim. A lead exposure lawyer can look at whether there is enough medical evidence to show that a child has elevated lead levels that rise to the level of a claim. In addition to blood tests, you will need to provide your attorney with medical records, and the attorney may need to consult with physicians, neuropsychologists, and certified industrial hygienists. It is also necessary to test the homes where the child lived for the presence of lead paint. In some cases, lead is in the plumbing due to solder rather than the paint. It may also be found in toys produced abroad or pottery. A violation of an applicable statute may be strong evidence of negligence. In Illinois, for example, the Lead Poisoning Prevention Act was enacted in 2005 to reduce and prevent lead poisoning in children. 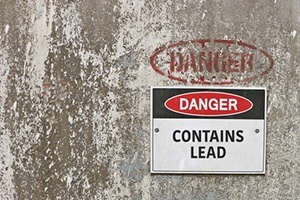 The law prohibits the use of lead-bearing substances on exposed surfaces of dwellings, around exposed surfaces of structures that children frequent, on objects used or installed that would be accessible to or chewed by children, or in any item that is intended to be used or chewed by children. Additionally, the law prohibits the sale of objects containing lead-bearing substances and requires warning statements on those types of substances. If you believe that your child or you were harmed by lead exposure, you should consult the lead exposure lawyers at Moll Law Group. Our firm represents injured individuals across the nation, including in states such as Ohio, Illinois, New York, Pennsylvania, California, Texas, and Florida. Billions of dollars have been recovered in cases in which we have been involved. Contact us online or call us at 312-462-1700 to set up a free consultation with a personal injury attorney.